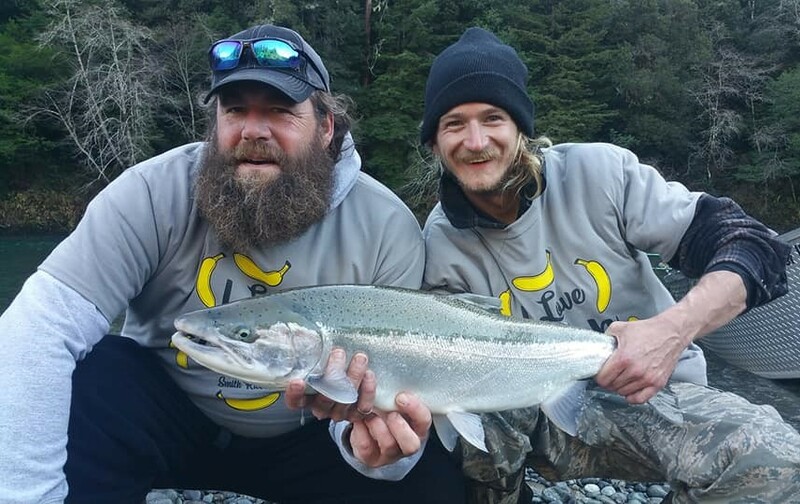 Devin Peterson, right, holds a nice hatchery steelhead landed earlier this week while fishing the Smith River with guide Sam Stover, pictured left. Photo courtesy of Carl Peterson. The fierce round of storms pounding the North Coast has brought a sudden stop to the winter steelhead season. From the Chetco south to the top of the Eel River system, you’ll be hard pressed to find any water that resembles anything close to green. And the dirty water conditions may be with us for a quite a few days as rain is in the forecast all the way through the weekend. There’s a real good possibility that neither the Smith nor the Chetco will drop back down to fishable levels until the middle of next week. For the other coastal rivers that aren’t so quick to clear – it could be a week or more before they resemble anything close to green. The biggest storm of the winter season is upon us, and is forecasted to dump up to seven inches of rain in some of the higher elevations beginning Wednesday and lasting through Sunday. The heaviest precipitation is predicted to fall on Wednesday and Thursday, with two and a half inches forecasted to fall in the Eureka area. More is expected in the mountain areas. The Eel River at Fernbridge is expected to surpass monitor stage by Thursday afternoon. In the coastal areas of Crescent City, two and a half inches is expected through Thursday, with another inch and a half on Friday. Rain is also predicted throughout the weekend, with nearly 3 inches predicted through Sunday. The Smith is forecasted to stay well within its banks, but will reach nearly 32,000 cfs on Sunday afternoon. The North Coast will begin to dry out on Monday, and the rest of the week is looking dry. HSD’s annual hatchery steelhead fishing contest, that runs from Jan. 19 to Feb. 23, will begin with a pint for nonprofits event at Mad River Brewing Co., on Saturday, Jan., 19 starting at 5 p.m. Event organizers will be on hand to talk about other events that will be held during the contest window. At the Kick Off event, anglers can sign up for the contest and CDFW warden John Fraley will be in attendance to review the fishing regulations. There will also be a fundraising silent auction and raffles to fund future restoration projects on the Mad River watershed. For more info., visit humboldtsteelheaddays.com or their Facebook and Instagram pages. Some of the biggest high and low tides of the year are forecasted over the coming holiday weekend. On Sunday in Eureka, a high tide of 9.1 feet at 10:47 a.m. will be followed by a low tide of minus-1.6 feet at 5:38 p.m. Monday’s high tide of 9.1 feet at 11:38 a.m. will be followed by a low tide of minus-1.9 feet at 6:23 p.m.
Domoic acid levels are finally beginning to decline north of Patrick’s Point and in Crescent City, providing hope that both sport and commercial crab seasons will open soon. The California Dept. of Public Health released lab results on January 11 from samples taken from Jan 5th and 6th. 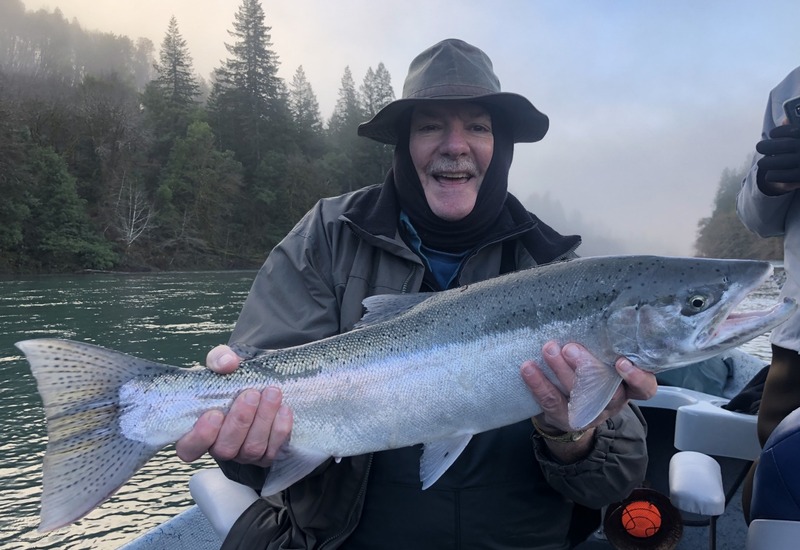 “Steelhead fishing was good last week between storms, but slowed over the weekend and early this week,” said Andy Martin of Wild Rivers Fishing. “There seems to be decent numbers of hatchery fish, but the overall number of fish appears to be a little low. There also are a ton of smolts throughout the river, which can make drifting bait less productive. 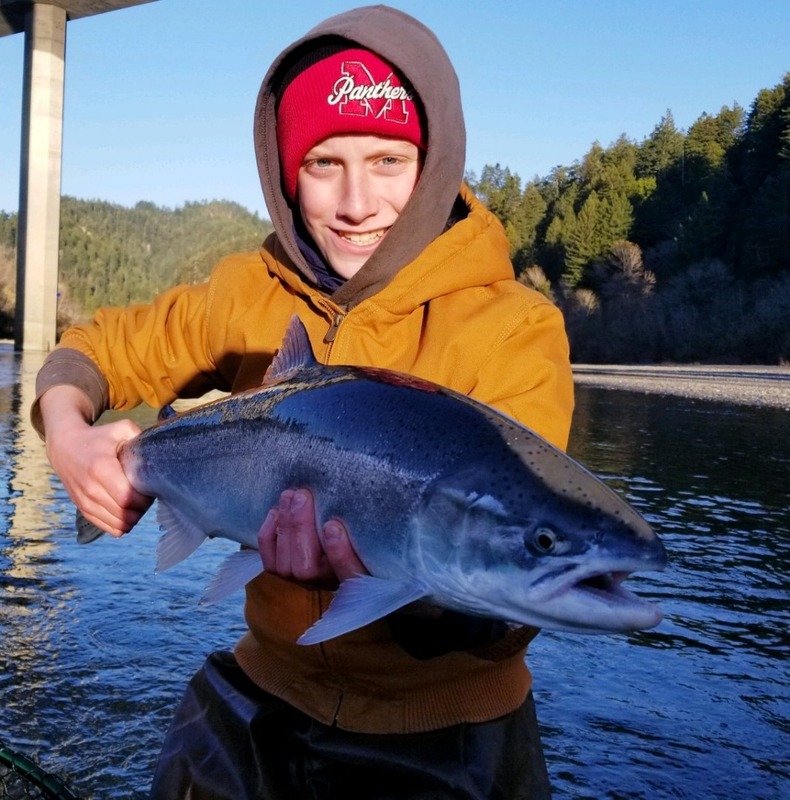 Hopefully this week’s storms bring in bigger numbers of fish.” The Chetco is predicted to reach nearly 28,000 cfs late Sunday night, and won’t fish until mid-next week at the earliest. Similar to the Chetco, the Smith fished well late last week and the weekend according to Mike Coopman of Mike Coopman’s Guide Service. “The river dropped into shape on Friday, and the fishing was really good. It fished good on Saturday as well, but then got a little tougher on Sunday and Monday. There were fish caught however, just not very many. This Friday looks like it will be plunkable in the morning and maybe side-drifting in the afternoon. The rest of the weekend it looks like it may be blown out. Hopefully this big rise will bring in some more fish,” Coopman added. The main stem was just starting to turn green around Rio Dell prior to Wednesday’s storm, now we’re back to square one. The Eel near Scotia is predicted to peak Thursday evening at just under 97,000 cfs. We’re looking at a couple weeks of dry weather before it’s fishable. Good news is it was full of bright steelhead, hopefully this big rise will keep them coming. The South Fork dropped into fishable shape on Monday, and the fishing reports from the last few days were good. It’s on the rise as of Wednesday afternoon and predicted to peak at Miranda at nearly 23,000 cfs Thursday afternoon. It should be on the drop beginning Monday. With no rain in the forecast next week, it could fish late in the week or by the weekend. The Duzen was in great shape the last two days, but was on a steep rise as of Wednesday afternoon. I didn’t hear any fishing reports, but prior to the latest storms there were quite a few caught. It’s forecasted to peak at nearly 19,800 cfs early Thursday morning. With rain in the forecast through the weekend, it will likely need a solid week to turn green. The Mad was still fishing as of Wednesday afternoon, and there were fish being caught according to Justin Kelly of Eureka’s RMI Outdoors. He said, “The fishing is still spotty, definitely not red hot. I heard there were fish caught right below the hatchery and a few below the bridge. A few were caught by the boats on Tuesday as well. Overall, I’d say it’s kinda slow, and the fish are scattered throughout the river.” The Mad is predicted to peak at just over 11,200 cfs (13.1 ft.) Sunday evening, and will likely need a good solid week of dry weather to clear.